Officials have been receiving numerous calls about hawks attacking people in the Mill Plain Road area. This hawk was in a tree on Sycamore Lane. FAIRFIELD — A mail carrier, a landscaper, a Sturges Highway jogger and a Sycamore Lane resident out for a walk are among the growing number of town residents reporting attacks by hawks over the past week and a half. The reports to police about aggressive raptors started last Friday and continued this week, prompting animal control officials to call in the Fire Department to help dislodge the birds’ nests. The attacks, most of them in the Mill Plain Road area, revived memories of similar incidents four years ago, when five people, including students at Fairfield Ludlowe High School, were targeted by dive-bombing hawks. Several people suffered bloody head wounds from the attacks. While two of the recent incidents occurred near Sturges Highway, the rest have been centered around Sycamore Lane and Old Mill Road, not far from the Mill River to the west and Sturges Park to the east. Those hawks have apparently been nesting in trees on Sycamore Lane. 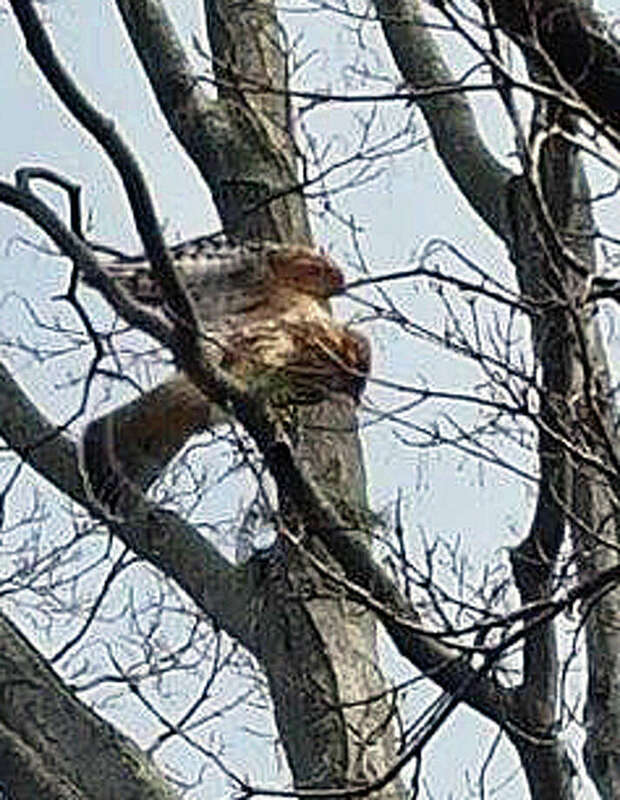 Town Animal Control Officer Paul Miller said a different hawk is believed to be responsible for attacks near Sturges Highway, which runs through the Greenfield Hill section of town. Police received a call around 12:30 p.m. last Friday from a Sturges Highway resident, who said her husband had been attacked by a hawk in front of their home. Her husband suffered a cut to his scalp inflicted by the bird, according to the report. Also on Friday, a Redding Road resident said she was jogging on Sturges Highway around 8:30 a.m. when something struck the back of her head. She never saw the bird, but ended up with an egg-sized lump on her head, according to the report. Since news began spreading about the series of hawk attacks, several other residents have called to report that they, too, have been attacked recently. An Unquowa Road resident said she was walking on Sycamore Lane around noon Thursday of last week, when something hit the back of her head. The woman suffered a cut to her head in the encounter, although she said she never saw the stealthy bird that apparently inflicted the wound. Sycamore Lane resident Jane McDonald was walking through her neighborhood Saturday about 8:30 a.m. when a hawk, which she saw perched in a low tree, flew at her, striking her head and knocking off her hat. It felt as though “a person punched me in the head,” she said of the incident. McDonald added she was not seriously injured, but said she has since seen the hawk sitting in a birch tree in her front yard, looking directly into her picture window. “I love to garden,” McDonald said, but now admits she’s a bit nervous about going outdoors. “We’ve seen them for a few weeks now,” she said, and would see the raptors circling high above while walking her dog outdoors. Another Sycamore Lane resident, Allison Cleary, pointed out the hawk nest, high up in a thin tree near her backyard. The birds built a new nest, she said, after a nest on property next door was removed. Cleary said she has had no run-ins with the hawks, which she said are not uncommon for the neighborhood. She said about two years ago, a nest had to be removed from the area because the hawks were diving at, but apparently not attacking, children waiting for the school bus. On Tuesday, a landscaper was working in a backyard on Old Mill Road about 1:15 p.m., and while picking up branches, he saw a hawk in a tree. At the same time, he told animal control officers, a second hawk then flew from behind, striking him in the head. The landscaper went to a local walk-in clinic for treatment of what he estimated were about 10 head wounds. The neighborhood mail carrier said he, too, has been attacked by a hawk while making deliveries. Now, he scans the sky before getting out of his truck, and if he has a package to deliver, he carries it above his head like a shield to ward off possible attacks. Animal control officers searched the area last week, and located a pair of hawks beginning to build a nest nearby. One of the hawks flew directly at an officer, at about eye level, but the officer was not struck. The state Department of Energy and Environmental Protection has been notified about the incidents, and Miller said his officers have been trying to get photos of the birds to determine if one of them has been banded for identification. One of two aggressive red-shouldered hawks removed from Barlow Road in 2012 was banded. Miller said the officers can dislodge the hawk nests as long as they hold no eggs, and they did so Wednesday with help from firefighters, who use a high-pressure spray to sweep the nests from trees. Three nests were removed, Miller said, who added that no special permission from state or federal agencies was needed. While officials think the birds are either red-tailed or red-shouldered hawks, a Sycamore Lane resident said the hawk that sits in a tree on the edge of his property every day just before sunset appears to be a broad-winged hawk. In 2012, hawk attacks in the general Mill Plain area began in January, and the incidents included injuries inflicted on a student leaving the Fairfield Ludlowe campus and a woman knocked off her bicycle. In March of that year, a falconer from the U.S. Department of Agriculture came to town to remove one of two red-shouldered hawks that had built a nest on Barlow Road. The red-shouldered hawk is a common forest-dwelling bird that can be found in the eastern U.S. and California, according to Cornell University's Lab of Ornithology. The bird can grow to 2 feet in length, weigh as much as 27 ounces and have a 42-inch wing span. This particular bird of prey, perhaps the most vocal American hawk, is known to eat small mammals, birds, reptiles, amphibians and crayfish. Its nest, often assembled in the main crotch of a tree near water, is usually a "large bowl" of sticks, dried leaves, strips of bark, Spanish moss, lichens and live conifer twigs.